1 .Short title and commencement:- (1) These rules may be called the Military Nursing Service Pay Rules, 2017. (2) They shall be deemed to have come into force on the 1st day of January,2016. 2. Save as otherwise provided under these rules, these rules shall apply to all Officers in the Military Nursing Service, who were on the effective strength of their Service as on the 1st day of January, 2016, and those who join the service thereafter, and to trainee Officers who were undergoing pre-Commission training on the 1st day of January, 2016, and to those trainee Officers who join service after that date. m. “revised emoluments” means the sum of (i) basic pay; and (ii) Military Service Pay; and. n. “Schedule” means a Schedule annexed to these rules. 4. Level of Ranks— The Level of ranks shall be determined in accordance with the various Levels as assigned to the corresponding existing Pay Band and Grade Pay or scale as specified in the Pay Matrix. The Level in Pay Matrix corresponding to the rank of a Military Nursing Service Officer is specified in Part B of the Schedule. Provided further that in case an Officer has been placed in a higher grade pay or scale between the 1st day of January, 2016 and the date of notification of these rules on account of promotion or upgradation, the Officer may elect to switch over to the revised pay structure from the date of such promotion or upgradation, as the case may be. Explanation.- (i) For the purpose of this clause the option to retain the existing pay structure under the provisos of this rule shall be admissible only in respect of one existing Pay Band and Grade Pay or scale. (ii) The aforesaid option shall not be admissible to any Officer commissioned on or after the 1st day of January, 2016, and he shall be allowed pay only in the revised pay structure. (2) (i) Military Service Pay is a compensation for the various intangible aspects linked to the special conditions of service in Army extended to Military Nursing Service Officers in the Military Nursing Service upto and including the rank of Brigadier. (iii) Military Service Pay shall be counted as pay for the purpose of computation of dearness allowance and pension. (ii) where a Military Nursing Service Officer is under suspension on the 1st day of January, 2016, the option may be exercised within one hundred and eighty days of the date of his return to his duty, if that date is later than the date prescribed in this sub-rule. 2.The option, along with an undertaking in the form appended to these rules, shall be intimated by the Military Nursing Service Officer to the Principal Controller of Defence Accounts (Officers). 3. If the intimation regarding option is not received by the Principal Controller of Defence Accounts (Officers) within one hundred eighty days of the date of notification of these rules, the Military Nursing Service Officer shall be deemed to have elected to be governed by the revised pay structure with effect from the 1st day of January, 2016. 4. The option once exercised shall be final. Note 1 – Military Nursing Service Officers whose services were terminated on or after the 1st day of January, 2016 and who could not exercise the option within the prescribed time limit, on account of discharge on the expiry of the sanctioned strength, release, resignation, dismissal or discharge on disciplinary grounds, are entitled to exercise option under sub-rule (1). Note 2 – Military Nursing Service Officers who have died on or after the 1stday of January, 2016 and could not exercise the option within the prescribed time limit, are deemed to have opted for the revised pay structure on and from the 1st day of January, 2016 or such later date is beneficial to their dependents, if the revised pay structure is more favourable and in such cases, necessary action for payment of arrears shall be taken by the Principal Controller of Defence Accounts(Officers). Note 3.- Military Nursing Service Officers who were on Annual Leave or any other leave on the 1st day of January, 2016, which entitled them to leave salary, shall be entitled to exercise option under sub-rule (1). i. the pay in the applicable Level in the Pay Matrix shall be the pay obtained by multiplying the existing basic pay by a factor of 2.57, rounded off to the nearest rupee, and the figure so arrived at shall be located in that Level in the Pay Matrix, and if such an identical figure corresponds to any Cell in the applicable Level of the Pay Matrix, the same shall be the pay, and if no such Cell is available in the applicable Level, the pay shall be fixed at the immediate next higher Cell in that applicable Level of the Pay Matrix. (i), the pay shall be fixed at the minimum pay or the first Cell of that applicable Level. 2. A Military Nursing Service Officer who is on leave on the 1st day of January, A Military Nursing Service Officer who is on leave on the 1st day of January, 2016 and is entitled to leave salary shall become entitled to pay in the revised pay structure from the 1st day of January, 2016, or the date of option for the revised pay structure. (3) A Military Nursing Service Officer who is on Study Leave on the 1st day of January, 2016 shall be entitled to the pay in the revised pay structure from the 1st day of January, 2016, or the date of option. (4) A Military Nursing Service Officer under suspension shall continue to draw subsistence allowance based on existing pay structure, and his pay in the revised pay structure shall be subject to the final order on the pending disciplinary proceedings. (5) Where the existing emoluments exceed the revised emoluments in the case of any Military Nursing Service Officer, the difference shall be allowed as Personal Pay to be absorbed in future increases in pay. 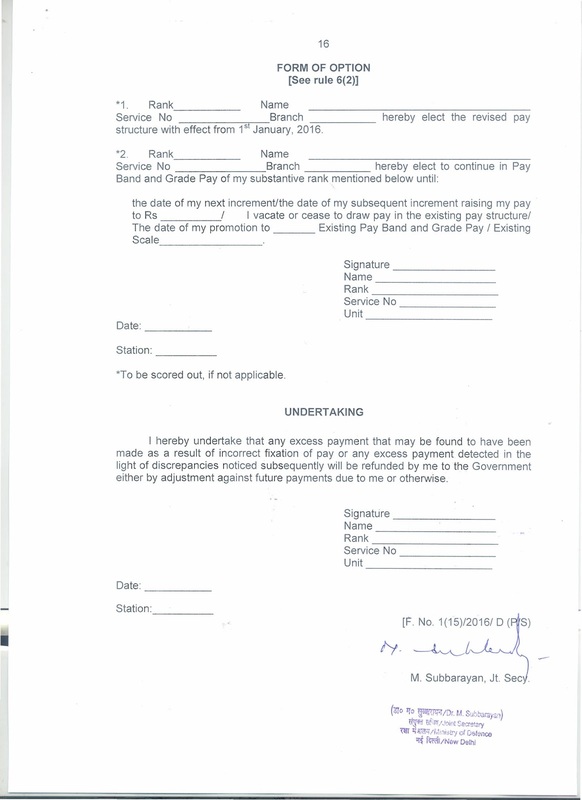 (6) Where in the fixation of pay in the Pay Matrix under rule 7, the pay in the Pay Matrix of an Officer, who, in the existing pay structure was drawing immediately before the 1st day of January, 2016 more pay in the Pay Band than another Officer in the same arm or service, gets fixed in the revised pay structure at a stage lower than that of such junior, his pay in the Pay Matrix shall be stepped up to the same Cell in the revised pay structure as that of the junior. (7) Where an Officer is in receipt of personal pay immediately before the date of notification of these rules, which together with his existing emoluments exceed the revised emoluments, then the difference representing such excess shall be allowed to such an Officer as personal pay, to be absorbed in future increase in pay. Provided that if the junior Officer was drawing more pay in the existing pay structure than the senior Officer by virtue of any advance increments granted to him, the provisions of this rule shall not be invoked to step up the pay in the Pay Matrix of the senior Officer. (ii) the senior Officer shall be entitled to the next increment on completion of his required qualifying service with effect from the date of re-fixation of pay. (1) On successful commissioning, the pay in the Pay Matrix of the Officer commissioned shall be fixed in first Cell of Level 10 and the period of training shall not be treated as commissioned service. (2) In case an Officer is commissioned between the 1st day of January, 2016 and the date of notification of these rules, where the existing emoluments exceed the sum of the pay fixed in the revised pay structure and the applicable dearness allowance thereon, the difference shall be allowed as Personal Pay, to be absorbed in future increments in pay. 9. Regulation of increments in the Pay Matrix:- The increment shall be asspecified in the vertical Cells of the applicable Level in the Pay Matrix. A Major in the Basic Pay of Rs. 68.000/- in Level 10B shall move vertically down the Cells in the same Level and on grant of increment, his Basic Pay shall be Rs. 70,000/-. 10. Date of increment in revised pay structure.– (1) There shall be two date10. Date of increment in revised pay structure.- (1) There shall be two datefor grant of annual increment namely, 1st January and 1st July of every year, instead of existing date of 1st July, provided that an Officer shall be entitled to only one annual increment, either on 1st January or 1st July depending on the date of his appointment or promotion or upgradation. (2) The increment in respect of an Officer appointed or promoted or upgraded during the period between the 2nd day of January and 1st day of July (both inclusive) shall be granted on the 1st day of January and the increment in respect of an Officer appointed or promoted or upgraded during the period between the 2nd day of July and 1 stday of January (both inclusive) shall be granted on 1st day of July. (a) In case of an Officer appointed or promoted or upgraded in the normal hierarchy during the period between the 2nd day of July, 2016 and the 1st day of January, 2017, the first increment shall accrue on the 1st day of July, 2017 and thereafter it shall accrue after one year on annual basis. Provided that in case of Officers whose pay in the revised pay structure has been fixed as on 1st day of January, the next increment in the Level in which the pay was so fixed as on 1st day of January, 2016 shall accrue on 1st day of July, 2016. Provided further that the next increment after drawal of increment on 1st day of July, 2016 shall accrue on the 1st day of July, 2017. 11. 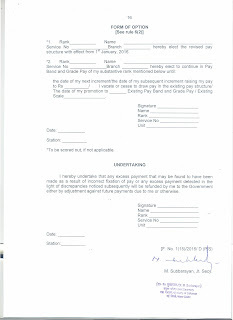 Revision of pay from a date subsequent to the 1st day of January, 2016.– Where an Officer who continues to draw his pay in the existing pay structure is brought over to the revised pay structure from a date later than the 1st day of January, 2016, his pay from the later date in the revised pay structure shall be fixed in the manner prescribed in accordance with rule 7. (i) One increment shall be given in the Level from which an Officer is promoted or upgraded and he shall be placed at a Cell equal to the figure so arrived at in the Level of the rank to which promoted or upgraded, and if no such Cell is available in the Level to which promoted or upgraded, he shall be placed at the next higher Cell in that Level. (ii) In case of promotion of an Officer from Level 12B to Level 13B, increment for promotion shall be calculated on the pay in the Level 12B being drawn immediately prior to promotion and the sum of the pay in the Level 12B plus the amount of increment for promotion plus Military Service Pay shall determine the pay in the Level 13B and the figure so arrived at will be located in the next higher Level 13B, and if such an identical figure corresponds to any Cell in Level 13B, the same shall be the pay in the revised pay structure and if the identical figure is not available in Level 13B, the pay in the Pay Matrix shall be fixed at the immediate next higher Cell in Level 13B of the Pay Matrix. 13. Pay of Officers commissioned with Ante Date for Pay on or after 1st day of January, 2016.– Pay of Officers commissioned with ante date for Pay on or after 1st day of January, 2016 shall be fixed notionally from the date of ante date in the relevant revised Level or pre revised scale as applicable and the pay shall then be arrived at as on date of commission after adding increments at the applicable rates for the period of ante date. 14. Mode of payment of arrears of Pay.– (1) The arrears, computed after deduction of subscription at enhanced rate of Defence Services Officers provident Fund with reference to the revised pay, shall be paid after deduction of adhoc arrears paid as per Government of India MoD letter No. 1(11)/2016/D(Pay/Services), dated 10th October, 2016. (ii) the aggregate of the pay and dearness allowance, and Military Service Pay to which he would have been entitled (whether such pay and Dearness Allowance had been received or not) for that period had his pay and dearness allowance not been so revised. 15. Overriding effect of rules.- The provisions of the Pay and Allowances Regulations (Officers), Army 1954, and existing instructions and regulations shall not save as otherwise provided under these rules, apply to cases where pay is regulated under these rules, to the extent they are inconsistent with these rules and these rules shall supersede SAI 4/S/2008 except as respects things done or omitted to be done before such supersession. 16. Power to relax.- Where the President is satisfied that the operation of all or any of the provisions of these rules shall cause undue hardship in any particular case, he may, by order, dispense with or relax the requirements of that provision to such extent and subject to such conditions as he may consider necessary for dealing with the case in a just and equitable manner. 17. Interpretation.- If any question arises relating to the interpretation of any of the provisions of these rules, it shall be referred to the Central Government for decision. Explanatory Memorandum— The Seventh Central Pay Commission has been implemented with effect from the 1st day of January, 2016. Likewise, the Defence Personnel of the Union of India are eligible for Seventh Central Pay revision with effect from the 1st day of January, 2016. Accordingly, these Rules have been given retrospective effect with effect from the 1st day of January, 2016. It is hereby, certified that by giving retrospective effect to these rules no one will be adversely affected. These rules may be called the Military Nursing Service Pay Rules, 2017. They shall be deemed to have come into force on the 1st day of January,2016.